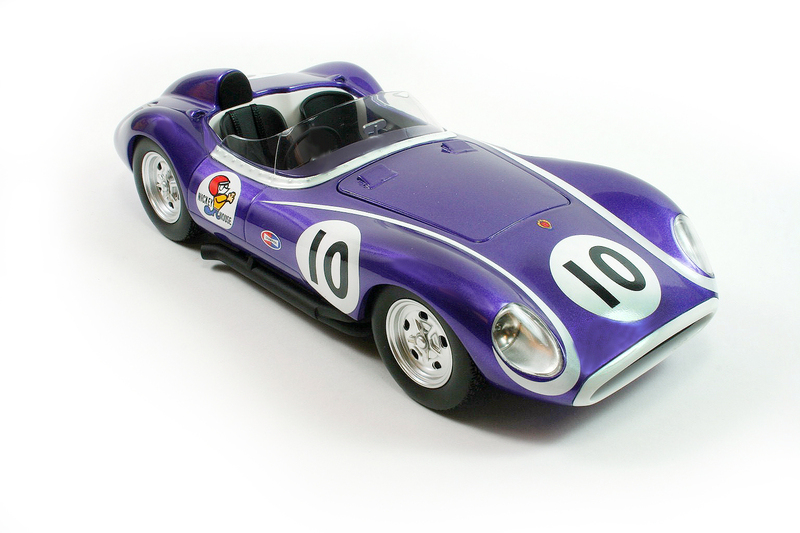 First came the 1959 Scarab that Jim Jeffords drove to a win at Meadowdale, but now Replicarz delivers the first Scarab to win a sports car race. 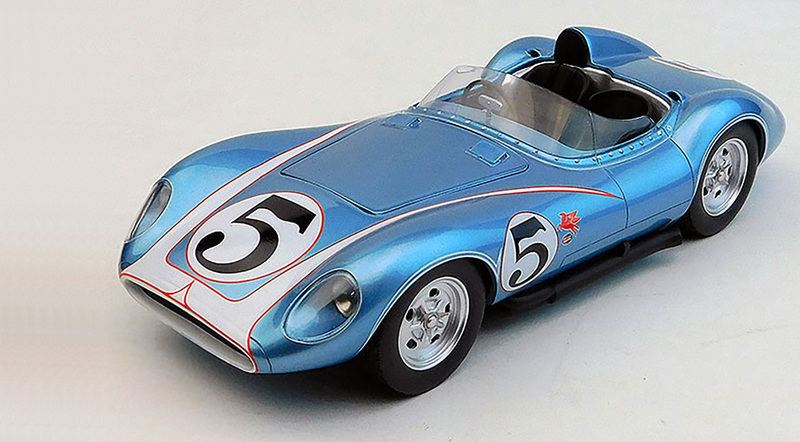 This beautiful bright light metallic blue racer is a replica of the one Chuck Daigh drove to victory at the Riverside International Grand Prix in California in 1958. A few years back at Road America, the Midwest’s finest road racing facility, I ran into racer Augie Pabst and his beautiful metallic blue Scarab Mk. II racer. Pabst, an heir to the brewing fortune, had been a succesful sports car racer in the late 1950s and early 1960s and was running his Meister Brauser Scarab in vintage races. 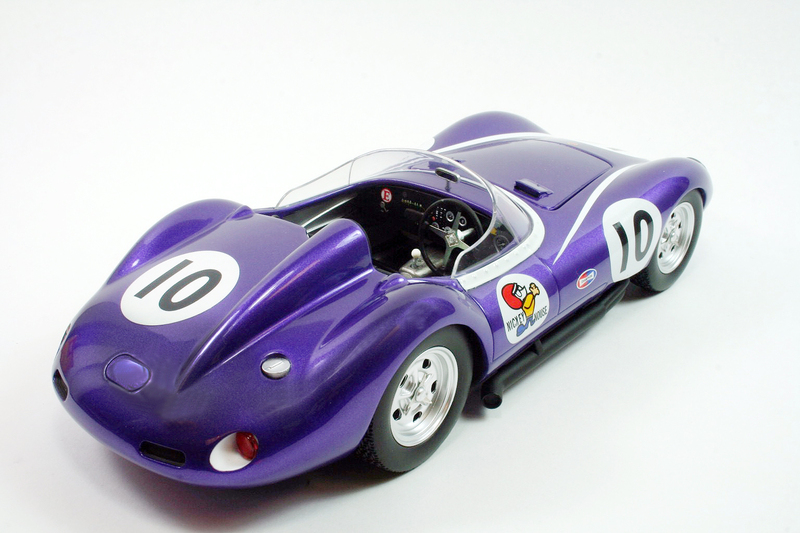 I’m a racing nut, but I’d never seen a Scarab before, so I was intrigued by the long-nosed front-engine car that looks part futuristic racer and part late 1950s roadster. Now, Replicarz has gone and produced a superb 1/18-scale resin die-cast of one of three Scarab Mk. IIs that were made and raced. This one was driven by another Midwestern sports car expert, Jim Jeffords, and features Nickey Nouse, the Chicago-based Nickey Chevrolet mascot. Lance Reventlow, son of Woolworth heiress Betty Hutton, was a California-based racer who owned Reventlow Automobiles Inc. He had cash! But had seen how the European automakers only sold year-old racers to outsiders, so decided to have the Scarabs designed and specially built for his team. He was looking for an advantage.